Spiritual advancement is built upon descents: as they become corrected, they serve as the material for the spiritual Kli. If you turn your sensation of being far away from spirituality into a spiritual ascent, you will thereby build your soul. Think of an electronic converter that straightens out an oscillating, off-and-on current, making it constant. The oscillating current enters the diode bridge where the positive phase passes through one contour and the minus phase passes through another. As a result, a constant current is produced at the exit. This is very much like the spiritual processes, where the descents turn into ascents. 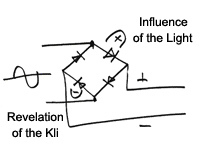 The Light acts as the positive phase, and the Kli is revealed as the negative phase, and they work together. Practically speaking, I affect my environment and the environment affects me. I project two feelings onto the environment: the feeling that it is important, and that I am worthless. In response, the environment impresses me with the feeling that bestowal is important and reception is worthless. If I take care of these four channels, then I will receive strength. When I am in the state of ascent and I have a lot of strength, I have to give to the environment. And when I fall and have no strength, I receive strength from the environment. This works in exactly the same way as the device that straightens out the oscillating current: sometimes I give to them, and sometimes they give to me. As a result, I always have strength. In fact, this is why the soul was separated into two parts: me and everything that’s outside of me. It was to enable me to treat others like myself. Everything outside me is also mine. It’s just that I work with it in this oscillating manner – sometimes I give strength, and sometimes it is returned to me. However, what I receive is many times greater than what I put in. In virtue of the darkness (the new Kli) that is revealed in me, I am able to receive enough strength from the environment to turn to the Force (the Light) of Correction. I am then always able to move forward, like a constant current that is always being straightened out. And thus, I rise higher and higher. 5 Minutes Of Light From The Daily Lesson: What Does The Tabernacle Symbolize?